Enterprise grade, web-based Time & Attendance software adapts to the organizations business rules and contributes to improved staff productivity. TimeCheck offers you a complete Time & Attendance solution to improve your business productivity with instant processing of employee time and efficient management of shifts, leaves & permissions, overtime, month & year closure and much more, with provision for payroll integration. TimeCheck is an enterprise grade web-based software for processing time recorded using any Industry standard SmartCard or Biometric terminals across the organization, including remote locations over the intranet or Internet. With TimeCheck’s configuration ability to fit your organization’s business rules, it helps managers take timely decisions in running their operations by simplifying time-consuming routine of processing their employees’ attendance data, against the allocated shifts and approved leaves to arrive at normal time and overtime. 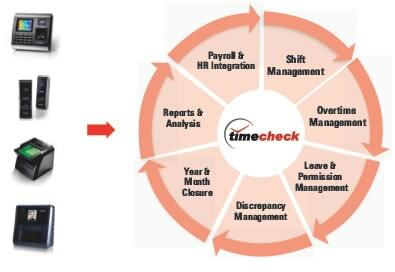 TimeCheck also ensures on-time payment of salaries, when integrated with payroll software. It protects sensitive employee information with comprehensive security layers limiting supervisors or managers with access to only their relevant information as per the organization hierarchy. Moulds to the Organization’s hierarchical reporting structure. TimeCheck’s Shift Management feature helps you in allocating shifts, temporary shifts and implementing shift exchange between any two employees in a much simpler way than you have ever imagined before. TimeCheck’s Overtime Management feature helps you to define and configure overtime settings like minimum & maximum overtime hours, calculation factor for weekly off overtime and holiday overtime hours effortlessly. TimeCheck gives you a wide range of flexibility to define Global Holidays common to all and Restricted Holidays that can be availed on approval against the quota defined. Splitting of Global and Restricted Holidays is one of the unique features offered by TimeCheck. With TimeCheck’s Leave & Permission Management, Employee can login to submit his leave request & any authorized personnel like your HR or Department Manager can view his leave request, eligibility details & either approve or reject his leave application. With TimeCheck’s Discrepancy Management, you can fill and close the discrepancies by raising & approving manual entry in case an Employee forgets to bring his swipe card, missed out to mark either his IN or OUT or has to travel outstation on-duty. TimeCheck offers extensive reports for your analysis and decision making data in different formats like PDF, excel and word to improve your time & attendance operations and reduce costs. Please visit www.timechecksoftware.com/features to know more about TimeCheck’s key features. 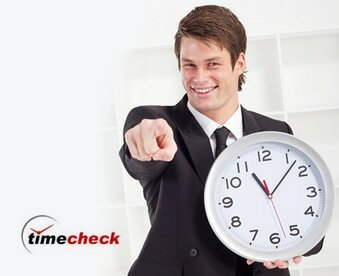 To know more about TimeCheck – Time & Attendance Software, please visit www.timechecksoftware.com.